Elizabeth Bailey ~ There is a beautiful song of faith that says “Goin’ home, goin’ home, I’m a goin’ home; Quiet like, some still day, I’m just goin’ home”. In her 96th year on July 3rd, 2018, a quiet, still day, Mum went home to be with her Lord, and to reunite with her husband Fred and two of her sons, Allen and Harold. As a child Elizabeth had many homes before settling with her parents in Fenelon Fall, ON. 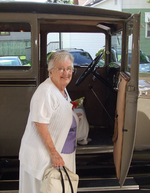 She arrived in Listowel in 1940, met and married Frederick Bailey and together they started a family. Mum is survived by Marianne and Calvin Ciphrey of Cobden, ON, Kenneth and Melody Bailey of Listowel, and Lynne and Joe Ruppel of Listowel. She dearly loved her twelve grandchildren; Daryl Bailey, Neil and Christy Bailey, Philip and Amie Ciphery, Rhonda and Malcolm Blaedow, Mary and Steve Manuel, Joseph Ciphery, Rebecca and Brad Minaker, Joshua and Kristen Bailey, Glenn and Jennifer Scott, Adam Scott, Cameron Ketchabaw and fiancée Kelsey Knoop, and Victoria and Stephen Chard. The family kept growing and Elizabeth has 19 great grandchildren, with number 20 arriving this month, and two great-great grandchildren. Music was a big part of Elizabeth’s life, especially singing. She loved to sing and was a member of the Mapleton Sweet Adelines. In church her voice could easily be heard singing notes that were way above the staff line and she played cornet in the Salvation Army Band for a time. She also loved to watch the Gaithers on TV. Mum did a lot of knitting and always had a hat and sweater ready whenever there was a new baby to welcome into the family. Afghans were also a specialty. Apartment 203 at Maitland Terrace was home for Elizabeth for the last 13 years and she very much enjoyed her neighbors there. Many evenings were spent in the lounge at the end of the hall doing puzzles with her special friends Helen Yost and Betty Morse. For a year or two she was the Maitland Terrace President and recently I found the joke book she bought so she could have a corny joke to say before she would give any announcements and then say grace at dinner time. She enjoyed a good laugh, had a razor-sharp wit and was a bit of a rascal. Working life began as a domestic and doing laundry for people before she began working at Spinrite and then at Campbell Soup. Elizabeth’s parents were Salvation Army Officers (pastors) and the Army was her church almost all of her life. When a Salvationist dies it is said that they have been Promoted to Glory. Our mother’s promotion is well-earned. She was true to her Lord for almost 96 years and we believe she has heard Him say, “Well done, thou good and faithful servant”. Visitation will be held at The Salvation Army, 625 Main Street, Listowel on Tuesday, July 10th from 6:00 to 8:00 p.m. , where the Celebration of Elizabeth’s Life will be held on Wednesday, July 11th at 2:00 p.m. Major Bruce Jennings and Major Wendy Johnstone officiating. Interment in Fairview Cemetery, Listowel. Memorial donations to Listowel Salvation Army, or the Listowel Memorial Hospital Palliative Care appreciated, and may be made through Eaton Funeral Home, Listowel.